Photo courtesy Karen Pickering. April plays in the water crossing. Recently I’ve begun a journey of healing and rest with my horse, April. She’s the best horse I could ever ask for and she has been my performance horse. If ever there was a connection between horse and rider, she and I feel it. When she was diagnosed with navicular in 2009, I was devastated. She has so much heart she just kept trying to do her best. Be sure to follow our progress on my blog. This month I’m excited to introduce you to our new editor, Kim Roe. 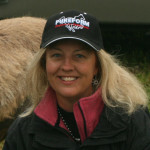 Kim is a longtime equestrian with a background in dressage and English principles of riding. Hand-picked by our previous editor Catherine Madera, I know she will fit in with our readership just fine. While I will miss Catherine a great deal, I’m excited to see what new life Kim breathes into the magazine. Welcome, Kim! As a publisher for 20+ years I’ve seen many changes in the industry. The vast online world has consumed readers. More and more I’m seeing people research information online, buy online, and be captivated by the latest trends in technology. Cell phones have become our main communication and research tool. While all this change is happening I still prefer the tactile feel of a magazine. There’s just no comparison to relaxing by a fire, coffee in hand, reading the latest issue of my favorite magazine. I see more stress. People are too busy to visit or stop and relax for a few minutes. There’s a sense of urgency to everything we do. No wonder some of our horses are psychotic. We’re stressed so they’re stressed. Facebook has taken over and invaded our phones and our work; our entire lives are played out on this form of social media. While it’s a great communication tool there’s just nothing like a good book or magazine in print! That being said, NW Horse Source has stepped up and produced a digital edition that you can read on your smart phone or tablet for those who prefer it that way. You never have to miss an issue of the magazine when your favorite store runs out. I’m especially excited about this month’s cover story on page 6. Learn about Kelly Munro and her recently purchased dream facility in Monroe called Grateful Pine Farm. This is my favorite part of my job. I love getting to know all the great horse people in the Northwest. We really do have a wealth of great people to learn from. Have a great July and enjoy the 4th. Happy Birthday America! Quote: Your present circumstances don’t determine where you can go; they merely determine where you start.